Are you a Home Brewer? Are you a Brewery or Distillery? On Friday 6th January we said goodbye to Stephen Pyne who, as he approaches his 69th birthday, has decided it is time to retire. Stephen has manned our Customer Enquiry/Orders desk since 2003, joining Warminster Maltings at a time of considerable hiatus. Soon after his arrival we ripped off the roof of the gutted the inside of the building that now houses our offices and reception rooms. For most of his first year with us Stephen was parked in a portakabin at the back of the maltings with very makeshift facilities. Not only that, at that time, head maltster Chris Garratt spent as much time out of the office as in, drumming up new business from all the new breweries that were opening up right across the country. So, working almost on his own, Stephen had ‘a baptism of fire’ as he quickly learnt the mysteries of making malt, as well as keeping all those voracious new appetites for malt satisfied. 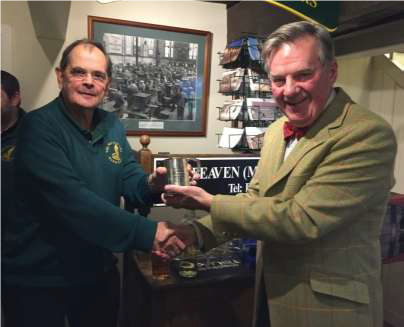 Presenting him with a Silver tankard, engraved to mark his near 14 years at the maltings, chairman Robin Appel thanked Stephen for his outstanding contribution of tact and diplomacy in dealing with sometimes ‘difficult situations’, and always keeping customers happy, even when they had forgotten to order their malt or ringing in an order after the lorry has left the yard. We wish Stephen a long and happy retirement. © Copyright 2019 by Warminster Maltings. All Rights Reserved.